It’s only a month since we were saying thanks and goodbye to Public Design WY #2. And now it’s time to wrap up Public Design WY #3. 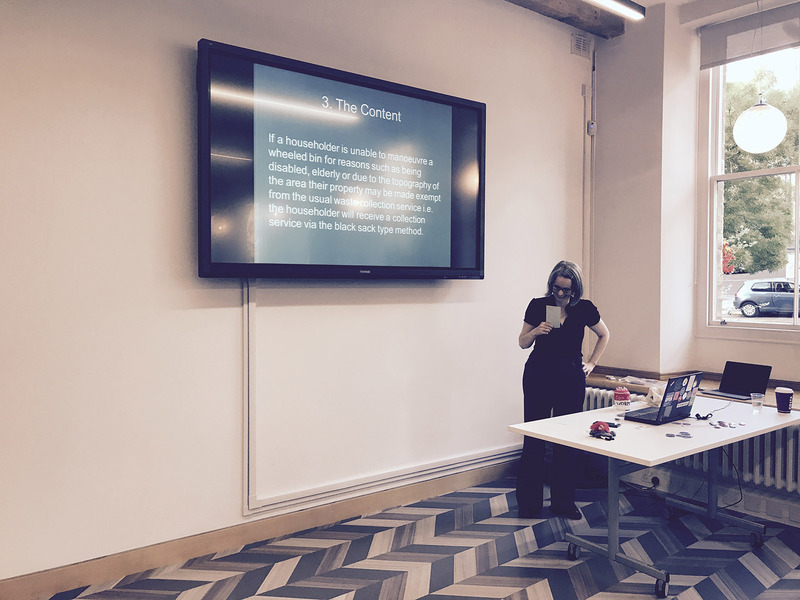 Held in the awesome DHEZ / Digital Catapult Centre Yorkshire space in Bradford, it was personally a great moment to hold a meet in the city I live in, to talk abut design, and hear about how the city’s council are designing services. Without Ian Sharp’s wonderful open offer to hold something there we would never have had the chance. Thank you, Ian. The sessions were a great dive into how Bradford council is shaping its services, open and honest in their content. 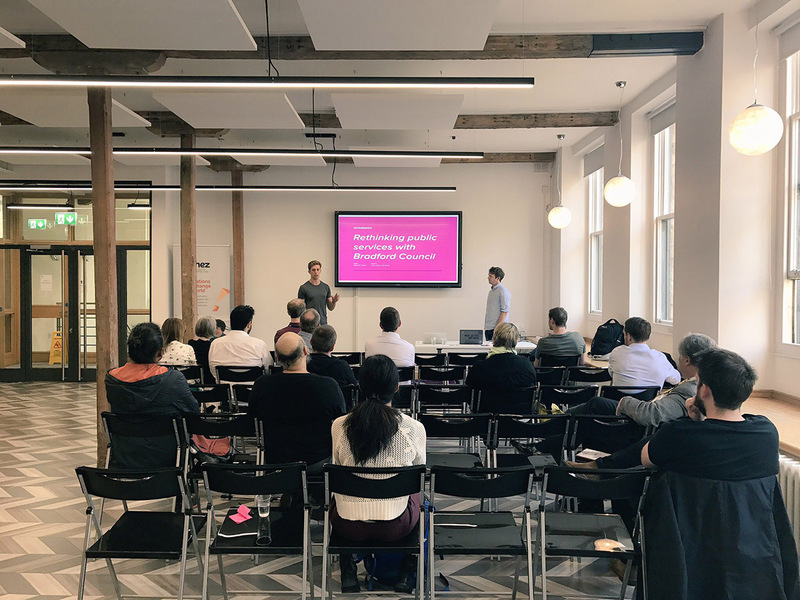 We heard from Alex Leslie and Jan Blum from FutureGov about the service design work they’ve been helping Bradford Council with around social housing. Bringing design thinking into the council, designing round people’s individual needs, working collaboratively as a collective team to prototype ideas, and being pragmatic as designers were strong points that came through. And the FutureGov team weren’t talking about what they wanted to do – this was talking about what they had done. Helen Valentine gave us a great session on the challenges, reliefs, and joy of content design on the continually improving bradford.gov.uk. Write content for everyone, whatever their situation and their abilities or disabilities. It’s a challenge, but Helen and the team are making headway and gaining support. Helen also closed off her session asking for help and advice for things she can do or use to further this work. It was heartening that Helen knew she could ask this at the meet, and people responded. If you are curious about the It Looks Like A Frozen Sausage post I wrote that started my chat with the team working on the Bradford council website you can read it. You can also learn more about the stickers I did for the council’s web team to mark the launch of their beta site earlier last year. The slides I did for the meet are on Google Drive. Ian Sharp and Katie Miller at DHEZ. Dominic Campbell, Matt Skinner, Alex Leslie and Jan Blum from FutureGov. FutureGov do good Twitter and Instagram. Worth following. Helen Valentine from Bradford council. Everyone that came. I asked if you’d come – and you did. It makes it worth it. Public Design #4 is already booked in. There’s no meet in August, but we’ll be back on Tuesday 12th September at Futurelabs in Leeds. We are working out the details of the meet at the moment, but we’ll let you know later in August. You can register to come along over at Meetup. And we are going to try to do another Public Design WY in Bradford soon after. Fingers crossed! Thanks for all your support so far.